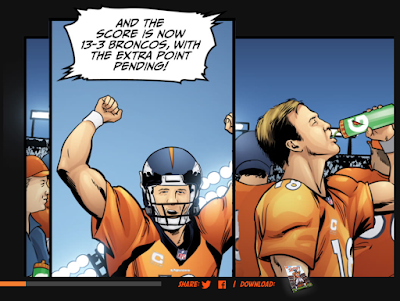 And to help hammer their point home, PepsiCo has recruited the NFL's Manning brothers. It's Gatorade's new "Sweat It To Get It" campaign, and their commercial spot has the football legends literally telling young teenage boys that 2 minutes of sweat buys them a Gatorade. Regular Gatorade's first ingredient is water. Its second and third ingredients are sugar. 100% of its calories come from sugar. It also contains a tiny bit of sodium, and a tiny bit of potassium. Most vending machine Gatorade is sold in 20oz bottles. 20oz of Gatorade contains 133 non-sating calories and just shy of 9 teaspoons of sugar. 2 minutes of moderate to high intensity exercise will burn at most 20 calories. And just in case you're tempted to tell me that the Sweat It to Get It campaign targets university students (because despite the kids in the commercial looking way too young to be in University, the vending machines are to be set up there), you should know that Gatorade also has a comic book series entitled, "The League of Champions" pumping the beverage. And for more on just how intensely Gatorade markets sugar water to children, have a read of Bettina Siegel's piece on Gatorade's G-Force and their high school infiltration.